We cannot predict when God will come to us with an invitation to take a leap of faith that will change our lives forever. But when the time does come — and it surely will — we all hope to have the same courage as Jesus’ first disciples who gave their “yes”and followed Him through the joys and trials of His public ministry. One of them was a man named James, a humble fisherman from Capernaum, who met Jesus by the Sea of Galilee. While he was on a boat mending nets with his brother John and their father Zebedee, Jesus called to him and his brother. They immediately left their boat, left their father along with the hired men, and followed Jesus (Matthew 4:18-22). James and John earned the nickname Boanerges, which means “sons of thunder,” for their strong tempers. These two, along with Simon Peter, were part of Jesus’ inner circle invited to witness events no one else saw: the raising of Jairus’ daughter from the dead (Mark 5:37-47), the Transfiguration (Matthew 17:1-3), and Jesus’ Agony in the Garden of Gethsemane (Matthew 26:36-37). 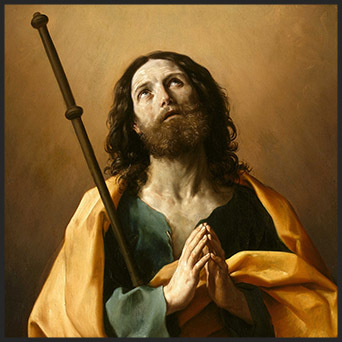 He is known as “the greater” to differentiate him from the other apostle also named James (“the less” and author of the Epistle/letter of James in the New Testament). In A.D. 44, James was decapitated by King Herod (Acts 12:2), making him the first apostle to be martyred. O glorious Apostle, St. James, who by reason of your fervent and generous heart was chosen by Jesus to be a witness of His glory on Mount Tabor, and of His agony in Gethsemane; You, whose very name is a symbol of warfare and victory: obtain for us strength and consolation in the unending warfare of this life, that, having constantly and generously followed Jesus, we may be victors in the strife and deserve to receive the victor’s crown in heaven. Amen.